Sept. 21, 2016 - The global timber price index GSPI was up 4.2% in the 2Q/16 after having fallen to the lowest level since 2009 in early 2016, according to the Wood Resource Quarterly. Higher sawlog prices in Russia, Brazil, Germany and British Columbia in the 2Q/16 contributed to the first increase of the GSPI sawlog price index in over two year, reports the Wood Resource Quarterly. An increase in lumber demand and slightly higher log trade than last year have put upward price pressure on softwood sawlogs in most major markets of the world this year. Seattle, USA. 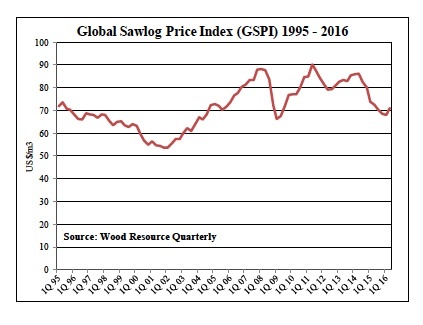 The Global Sawlog Price Index (GSPI) was up 4.2% in the 2Q/16 to US$71.18/m3, the highest quarter-over-quarter increase since the 2Q/11. Sawlog prices increased in 16 of the 19 regions tracked by the Wood Resource Quarterly (WRQ) and were generally higher in both the local currencies and in US dollar terms. The biggest price increases in dollar terms occurred in Russia, Brazil, Germany and British Columbia. The only regions that experienced lower log prices in the 2Q/16 were Chile, where lumber export markets weakened, and the US Northwest, where log export to Asia slowed down the first few months of the year and the domestic sawmills run at fairly low operating rates. During the first half of 2016, global trade of softwood logs was up about one percent as compared to the same period in 2015, according to estimates by the WRI. Almost 50% of globally traded logs are imported to countries in Asia (specifically China, South Korea and Japan) followed by Europe and North America. Asia’s share was down from 52% in 2015 because of reduced importation to China. The biggest change over the past ten years has been that the Nordic import share of the global log trade has fallen from almost 18% in 2005 to only nine percent in 2015, because the three Northern European countries have increased their domestic timber harvests to decrease the reliance on imported wood raw-material. The global log trade continued at a healthy pace in early 3Q/16 with shipped volumes generally being higher than the same time in 2015.